Stifled is a multi-award winning, Sound-based Stealth Thriller Mystery, where SOUND is the only way you SEE and the enemies HEAR your fear through your microphone input. Microphone input and VR Features are optional. Vive Wand and 3DRudder support! We FINALLY completed work on Stifled and have enabled Vive Wand support. 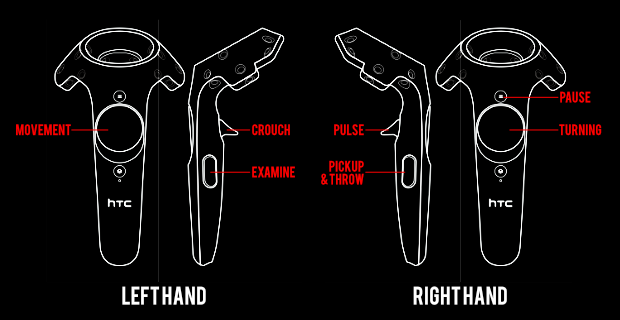 Check out the image below on how the controls are mapped. We're also happy to announce the support for the 3DRudder! Sorry for taking so long with these updates, but we hope you enjoy them! We've got a new update that adds Vive wand support and fixes the head in the ceiling issue! Would love some help from the community members who own a Vive! Reply this post (make sure your PMs are open) so we can reach out to you. Alternatively, you can join us on Discord and reach out to me (thatjustinng)! Additional Notes: Recommended for VR.